UC Cooperative Extension specialist Ali Pourreza flies a drone in an orchard. High-speed broadband at Kearney Research and Extension Center will make it easier for researchers to collect and share data. The nonprofit organization CENIC has awarded the UC Division of Agriculture and Natural Resources its 2018 Innovations in Networking Award for Broadband Applications. 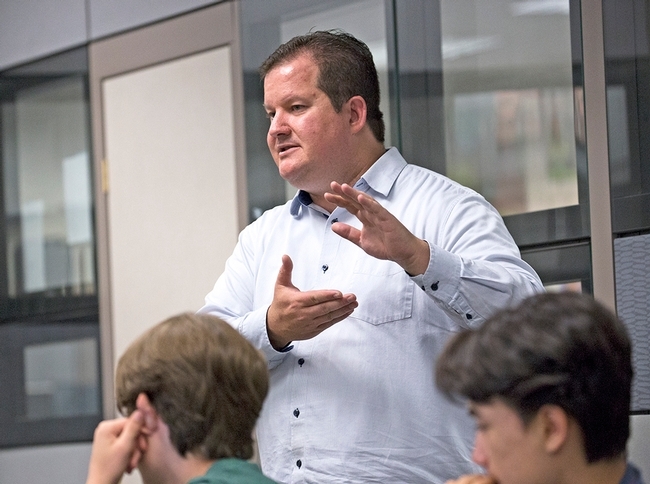 The award recognizes work to extend high-speed broadband to University of California researchers in rural communities across California by connecting UC ANR sites to the California Research and Education Network (CalREN). Project leaders being recognized include Tolgay Kizilelma, chief information security officer; Tu Tran, associate vice president for business operations; and Youtsey. Until now, UC ANR facilities have been hamstrung by poor Internet connectivity, hindering their ability to support campus-based researchers and UC Cooperative Extension scientists who are engaged with community and industry partners to ensure that California has healthy food systems, environments and communities. Extending from the Oregon border in the north, through the Sierra foothills and Central Valley, along the Pacific Coast and south to the Mexican border, UC ANR's research and extension facilities are situated among California's rich and unique agricultural and natural resources. This allows for the application of scientific research to regional challenges and issues. Today, nearly all research and data analysis involves remote collaboration. To work effectively and efficiently on multi-institutional projects, researchers depend heavily on high-speed networks and access to large data sets and computing resources. The high-speed broadband connection also provides a new way for Cooperative Extension advisors to collaborate with farmers, naturalists and others in these rural regions. 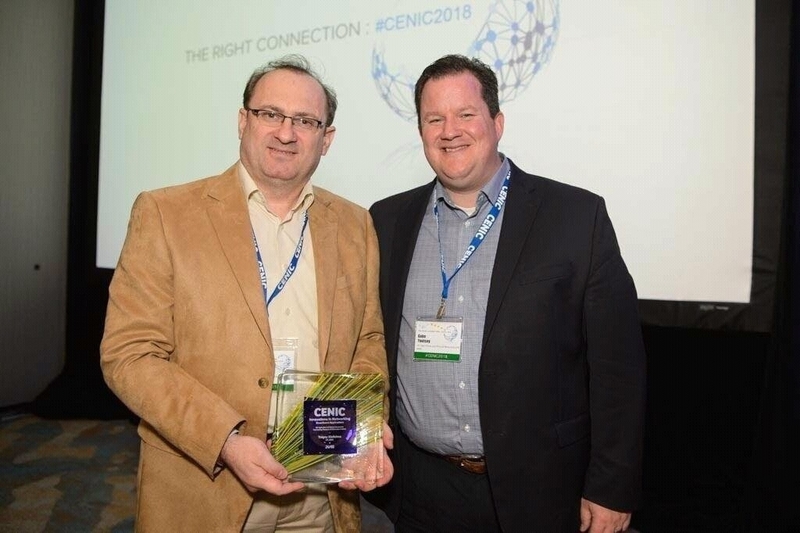 Tolgay Kizilelma, left, and Gabe Youtsey accept CENIC 2018 Innovations in Networking Award for Broadband Applications. 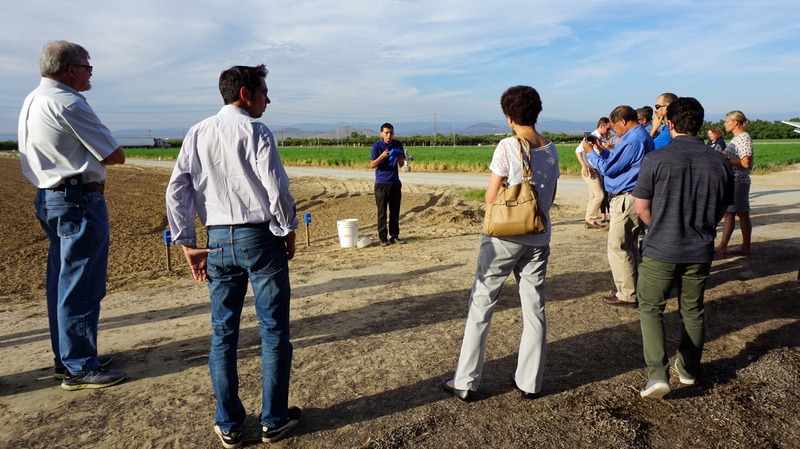 In 2016, CENIC began working with UC ANR to connect its nine research and extension centers to CalREN, equipping them with internet speeds comparable to those found on UC campuses. For example, the UC Hopland Research and Extension Center in Mendocino County and the UC Desert Research and Extension Center in Imperial County are both connected at 500 Mbps, five times their previous level of connectivity. Due to the remote location of most of these facilities, the work involved in identifying suitable pathways for connections between each site and the CalREN network has been extensive. Engineers from CENIC and UC ANR collaborated on network design, deployment, and troubleshooting to equip these facilities with the high-speed internet they need. 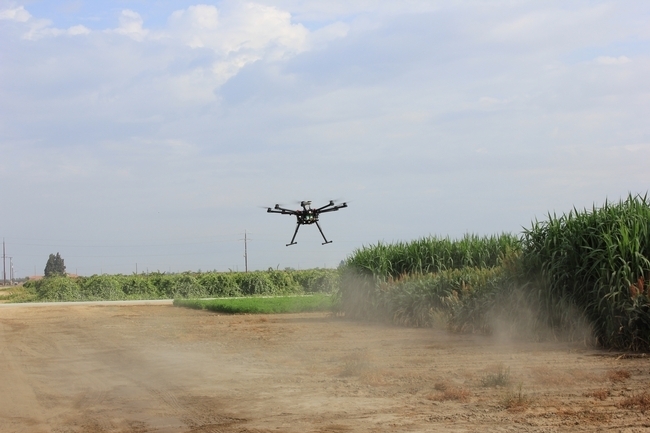 High-speed connectivity with significant bandwidth now allows researchers to use equipment like infrared cameras to collect data on how crops respond to heat, among many other electronic tools. Farmers who are unable to visit the Research and Extension Centers can now connect virtually and tune in to real-time video streams, gaining access to the latest knowledge. 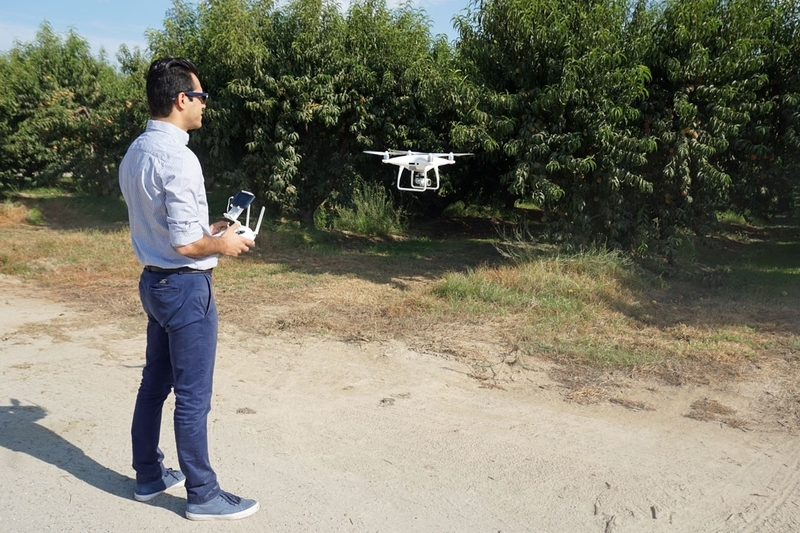 In addition to the Research and Extension Centers, the Citrus Clonal Protection Program in Riverside is now connected to CalREN. Elkus Ranch, the environmental education center for Bay Area youths, the UC ANR administrative offices in Davis and 30 UC Cooperative Extension sites are in the process of being connected. Innovations in Networking Awards are presented each year by CENIC to highlight the exemplary innovations that leverage ultra-high bandwidth networking, particularly where those innovations have the potential to transform the ways in which instruction and research are conducted or where they further the deployment of broadband in underserved areas. 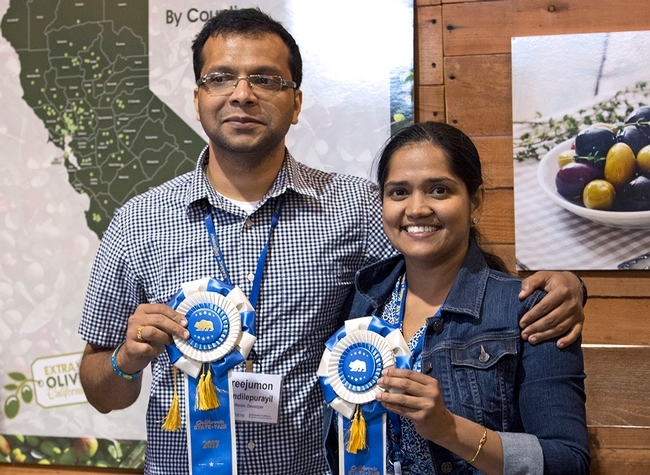 Sreejumon Kundilepurayil, left, and Vidya Kannoly and their Dr. Green app took first place in the Apps for Ag hackathon. Dr. Green uses artificial intelligence and machine learning to quickly advise growers how to treat ailing plants. For 48 hours, innovators and entrepreneurs at the Apps for Ag Hackathon labored over laptops at The Urban Hive in Sacramento before pitching their ideas to judges at the California State Fair. More than 40 people, some from as far as New York and Texas, competed for a $10,000 grand prize and assistance from UC Agriculture and Natural Resources to turn their ideas into commercial enterprises. Ultimately Dr. Green, a mobile app to diagnose plant problems, took the top prize on Sunday (July 30). The second-place Greener app also helps people diagnose and treat plant diseases. Farm Table, an app that promotes agritourism, came in third place. One goal of the hackathon was to produce solutions for military veterans who are becoming farmers. The U.S. Department of Veterans Affairs was a major sponsor of the event and leaders from Washington D.C. were on site all weekend participating. 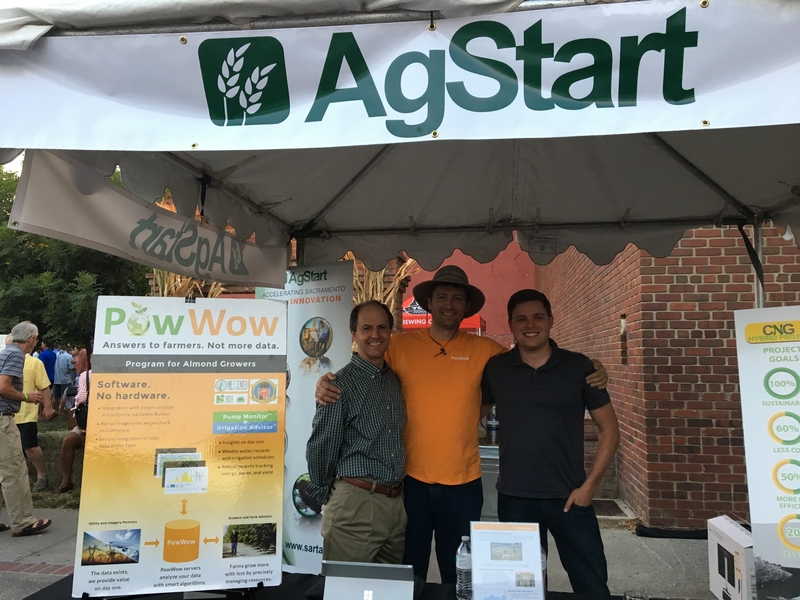 “There was an amazing range of applications this year,” said Gabriel Youtsey, chief innovation officer for University of California Agriculture and Natural Resources, which hosted the hackathon. Twelve teams pitched new ways to apply technology to improve the food system. “There was an application to take a picture of a plant and it'll identify the plant disease – which can help anyone from backyard gardeners to professional growers – all the way to an application for community-supported fisheries, which helps fishermen better scale their businesses and allows for customers to get the freshest fish,” Youtsey said. There was an app to match unemployed veterans with farm jobs, an online resource for bees, an app to simplify shipping logistics, an app for detecting mold on produce and many more solutions for food-related problems. Figuring out why a plant is ailing can be time-consuming for a new farmer or backyard gardener. The plant doctor is always in with Dr. Green. 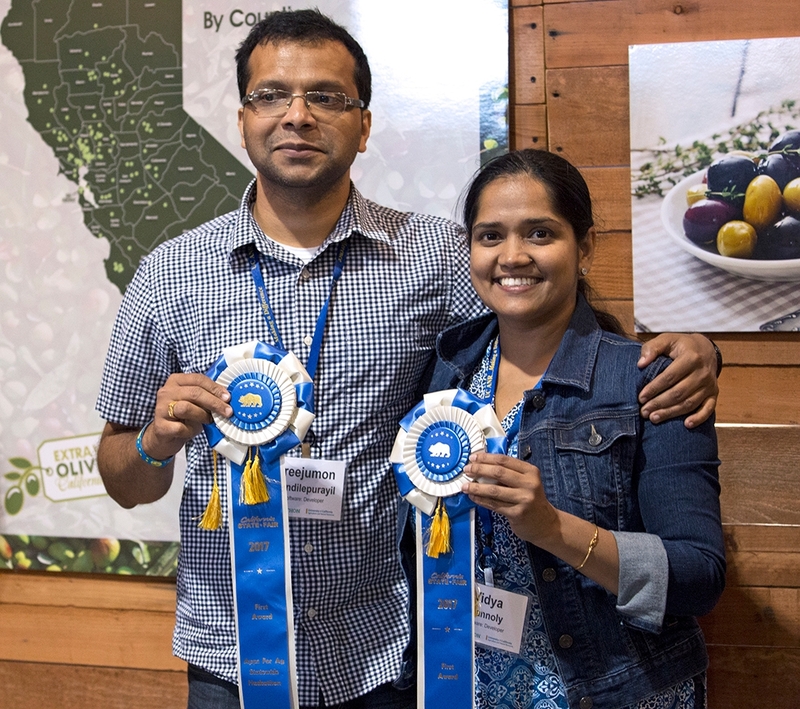 The app created by Sreejumon Kundilepurayil and Vidya Kannoly of Pleasanton will help people identify crop diseases quickly through artificial intelligence and machine learning. The app can incorporate data from sensors monitoring temperature, light and soil moisture to alert growers to problems. Using a smart phone, backyard gardeners and growers can take a photo of plant symptoms and get a diagnosis or use the messaging feature to ask a question about symptoms and receive advice immediately. Kundilepurayil and Kannoly won $10,000 and tickets to the UC Davis Food and Ag Entrepreneurship Academy, $3,000 worth of Google Cloud Platform credits, plus other resources to help the team start their venture. 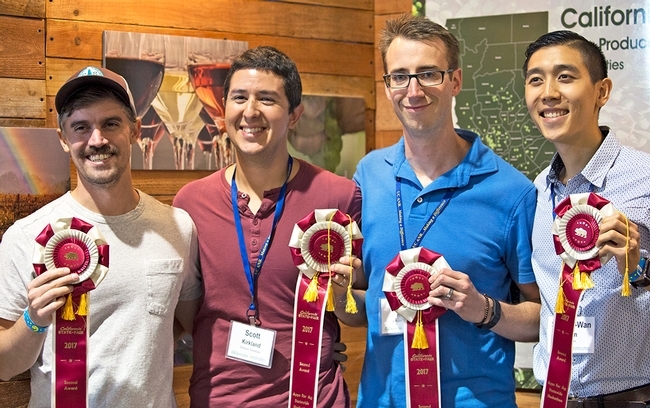 From left, Calvin Doval, Scott Kirkland, John Knoll and Shiang-Wan-Chin's Greener app, which diagnoses plant diseases from a photo, took second place. Using a smart phone, home gardeners can take a photo of plant symptoms and quickly get a diagnosis and recommended IPM treatment from the Greener app, created by Scott Kirkland, John Knoll and Shiang-Wan Chin of Davis and Calvin Doval of Oakland. They won $5,000 and $1,000 worth of Google Cloud Platform credits and other resources to help start their venture. From left, Heather Lee, Will Mitchell and Zhenting Zhou finished third with their Farm Table app, which promotes agritourism. The Farm Table app aims to make farms more economically sustainable and educate the public about food through agritourism. 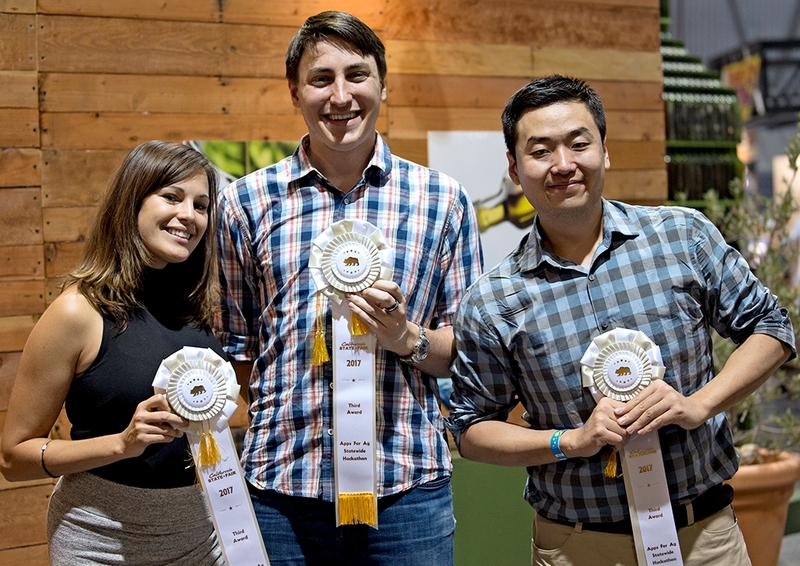 Heather Lee of San Francisco teamed up with Will Mitchell of Sacramento and Zhenting Zhou of New York City to create the agritourism app. They won $2,500 and $1,000 worth of Google Cloud Platform credits and other resources to help start their venture. 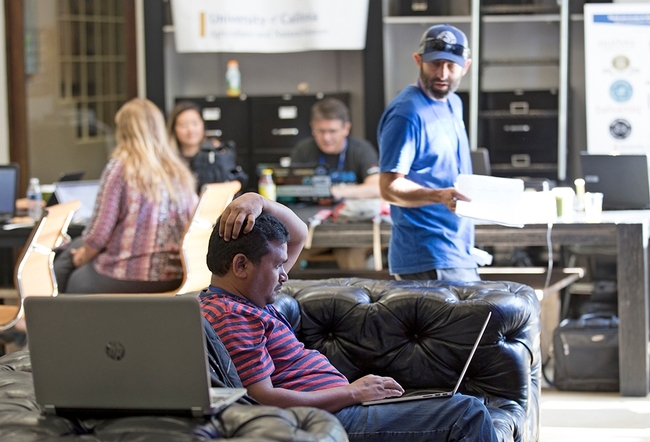 For 48 hours, hackathon participants worked feverishly on their projects at the Urban Hive in Sacramento. Judges included Joshua Tuscher of the U.S. Department of Veterans Affairs; Robert Trice, investor and founder of The Mixing Bowl Hub; Jenna Rodriguez, product manager at Ceres Imaging; Ann Dunkin, chief information officer for the County of Santa Clara; and Jessica Smith, vice president of Strategic Partnerships at AngelHack. Apps for Ag is a food and agriculture innovation event series hosted by University of California Agriculture and Natural Resources (UCANR) and sponsored by IO Labs, The Urban Hive, California Community Colleges and the California State Fair. “We're growing the pipeline of young innovators, getting entrepreneurs and technologists interested in applying technology to solving problems in the food system,” said Youtsey, who led organization of the hackathon. “UC ANR is the original innovation engine in food, agriculture and natural resources in California and has been so for over 100 years. This is just taking another spin at tackling innovation in food and agriculture through an innovative competition style format with technology,” he said. Additional support for the hackathon was provided by Valley Vision, The Mixing Bowl, Farmer Veteran Coalition, AngelHack, Nutiva, Google Cloud Platform, Royse Law Firm, Hot Italian, GTS Kombucha, Startup Sac, AgStart, StartupGrind Sacramento, Future Food, Internet Society San Francisco Bay Chapter, Sacramento Food Co-op, Balsamiq and YouNoodle. Last year's winners Giving Garden at work. Food and agriculture innovators are invited to compete for $10,000 and other prizes at the 2017 Apps for Ag Hackathon July 28-30 at The Urban Hive in Sacramento. Food and agriculture innovators, farmers and entrepreneurs are invited to compete for $10,000 and other prizes at the 2017 Apps for Ag Hackathon July 28-30. Contestants will gather at The Urban Hive in Sacramento to create new ways to apply technology to improve the food system. At the hackathon, anyone with an idea for technology that would simplify a task for farmers or consumers can team up with people who can turn the idea into something functional. It can be a mobile app, device or a machine. “Apps for Ag is not just about technology and agriculture, it's about bringing together uncommon collaborators from all kinds of backgrounds and organizations to solve problems and create innovation that transform our food supply and the system behind it,” said Gabriel Youtsey, chief information officer for University of California Agriculture and Natural Resources, which is hosting the hackathon. Gabriel Youtsey describes how participants will present ideas, form teams, build their software or machines, then pitch their inventions to judges. To inspire the innovators as they develop their food and agriculture ideas and technology, a few speakers will kick off the hackathon with their perspectives. Last year's Apps for Ag winner Deema Tamimi, CEO and founder of Giving Garden, will talk about challenges facing the food system. A veteran farmer will discuss the hurdles farmers face today and the potential for technology to meet their needs. Joyce Hunter, former deputy CIO at the USDA will give a brief talk about the power of open data and how it can be used to solve some of our greatest agricultural and food challenges. Following opening remarks, participants will present their ideas, form teams and begin to build their software applications and pitch decks over the next two days. Expert mentors will assist the teams and food will be provided throughout the event. On Sunday, July 30, at 4 p.m. the teams will present their apps to a panel of judges at the California State Fair. Members of the public are welcome to attend. Judges include Joshua Tuscher of the U.S. Department of Veterans Affairs; Robert Trice, investor and founder of The Mixing Bowl Hub; Jenna Rodriguez Product Manager at Ceres Imaging, Ann Dunkin, CIO of County of Santa Clara, California; Nicole Rogers, director of marketing and communications for Nugget Market; and Jessica Smith, vice president of Strategic Partnerships at AngelHack. The three top teams will be awarded cash prizes and resources to help turn their technology into a business. The winning team will receive $10,000, second place gets $5,000 and third place gets $2,500. The Apps for Ag Hackathon will be held at The Urban Hive in Sacramento. Register for free at http://www.apps-for-ag.com. 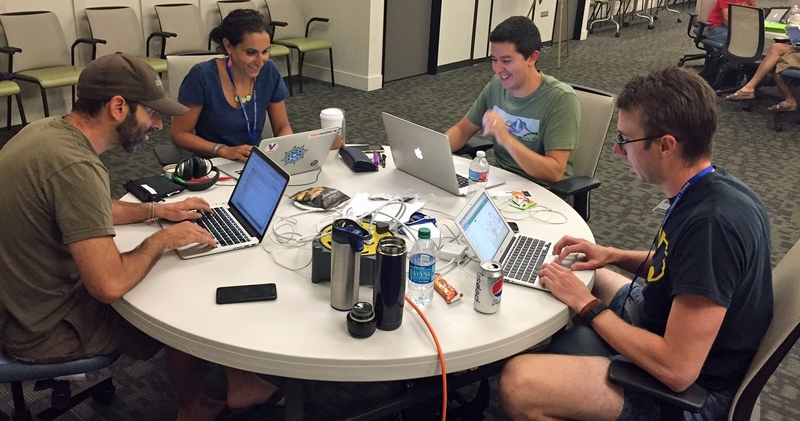 To learn more about the hackathon, visit http://apps-for-ag.com/hackathon or email questions to info@apps-for-ag.com. Apps for Ag hackathon finalists in 2016 after judging. The three top teams will be awarded cash prizes and resources to help turn their technology into a business..
Support for the hackathon is also provided by Sacramento and Davis community businesses and organizations: Valley Vision, The Mixing Bowl, Farmer Veteran Coalition, AngelHack, Nutiva, Google Cloud Platform, Royse Law Firm, Hot Italian, GTS Kombucha, Startup Sac, AgStart, StartupGrind Sacramento, Future Food, Internet Society San Francisco Bay Chapter, Sacramento Food Co-op, Balsamiq and YouNoodle. The Apps for Ag series will soon become a part of The Verde Innovation Network for Entrepreneurship (The VINE), UC ANR's statewide initiative and network for food and agriculture innovators, researchers, investors and agencies slated to launch in late 2017.